Dialysis-dependent ESRD is a serious illness with high disease burden, morbidity, and mortality. Mortality in the first year on dialysis for individuals over age 75 years old approaches 40%, and even those with better prognoses face multiple hospitalizations and declining functional status. In the last month of life, patients on dialysis over age 65 years old experience higher rates of hospitalization, intensive care unit admission, procedures, and death in hospital than patients with cancer or heart failure, while using hospice services less. This high intensity of care is often inconsistent with the wishes of patients on dialysis but persists due to failure to explore or discuss patient goals, values, and preferences in the context of their serious illness. Fewer than 10% of patients on dialysis report having had a conversation about goals, values, and preferences with their nephrologist, although nearly 90% report wanting this conversation. Many nephrologists shy away from these conversations, because they do not wish to upset their patients, feel that there is too much uncertainty in their ability to predict prognosis, are insecure in their skills at broaching the topic, or have difficulty incorporating the conversations into their clinical workflow. In multiple studies, timely discussions about serious illness care goals, however, have been associated with enhanced goal-consistent care, improved quality of life, and positive family outcomes without an increase in patient distress or anxiety. In this special feature article, we will (1) identify the barriers to serious illness conversations in the dialysis population, (2) review best practices in and specific approaches to conducting serious illness conversations, and (3) offer solutions to overcome barriers as well as practical advice, including specific language and tools, to implement serious illness conversations in the dialysis population. Individuals with ESRD on dialysis, currently numbering over 400,000 in the United States, face significant morbidity and mortality (1). Mortality in the first year on dialysis for patients over 75 years old approaches 40% (2), and even those with better prognoses face multiple hospitalizations and declining functional status (3–5). Long-term outcomes from aggressive treatment, such as cardiopulmonary resuscitation, are poor in patients on dialysis (6), and recent data also suggest that, for individuals over age 80 years old, dialysis may offer little to no benefit over conservative management (7,8). In the last month of life, patients on dialysis over age 65 years old experience higher rates of hospitalization, intensive care unit admission, procedures, and death in hospital than patients with cancer or heart failure, while using hospice services less (9). In contrast, 65% of patients on dialysis would prefer to die at home or in hospice, and over 50% would choose care focused on relieving pain and discomfort rather than prolonging life (10,11). Perhaps more importantly, 60% of patients on dialysis regret starting dialysis (11), and nearly one fifth of annual deaths of patients on dialysis result from patient decisions to withdraw (1). Serious illness conversations are clinician-led conversations about goals, values, and preferences with individuals with serious illnesses, such as ESRD. Serious illness conversations span a wide range of encounters, including discussions of goals of care, discussions of advance directives, and end-of-life discussions (12). They involve addressing the patients’ experience of their illness and quality of life and sharing of goals, fears, and concerns, and they may or may not be focused on decision making regarding specific medical procedures or interventions (13,14). Serious illness conversations have been associated with enhanced goal-consistent care—including increased likelihood of dying in the patient’s preferred setting, reduced hospitalization, and less aggressive care at the end of life—and positive family outcomes without an increase in patient distress or anxiety (15–20). Among patients on dialysis, such conversations are associated with greater hospice utilization and increased likelihood that death will occur out of the hospital (21). However, these conversations occur infrequently. Although 90% of patients on dialysis report wanting to have such a conversation with their nephrologist, <10% of patients report doing so (11); <50% of patients have completed an advance directive, and these completed advance directives are usually limited to preferences with respect to cardiopulmonary resuscitation and mechanical ventilation, rarely addressing preferences related to dialysis therapy and other treatments (22,23). This paper will identify barriers to serious illness conversations in the dialysis population, review best practices in conducting serious illness conversations, and offer solutions to overcome barriers and specific approaches to apply best practices to implement serious illness conversations in the dialysis population. Several barriers need to be overcome to allow for meaningful serious illness conversations in ESRD. Understanding their disease and prognosis can be helpful to patients when discussing goals and treatment preferences. Although over 90% of patients on dialysis believe that it is important to know their prognosis or how their disease will progress (11), they often are not well informed. Patients on dialysis have varied expectations of the symptom relief benefits of dialysis, and although they may be aware of the transportation needs and time commitment (24), they often do not appreciate the high procedure and admission rates associated with dialysis treatment. Furthermore, patients on hemodialysis are often overly optimistic about their long-term survival or transplant candidacy (10). Despite patients wanting to understand their disease course and prognosis, nephrologists are often reluctant to discuss it, declining to provide any estimate of prognosis for as many as 60% of patients (10). Physicians who do share prognosis often err on the side of excessive optimism, which can hinder effective patient decision making and delivery of goal-consistent care. Many nephrologists shy away from serious illness conversations for multiple reasons: they find it difficult to commit the time, do not view it as their responsibility or an important part of their clinical role, do not wish to upset patients, feel that there is too much uncertainty in their ability to predict prognosis, and/or are insecure in their skills at broaching the topic (25,26). Although nephrology trainees indicate a desire to improve their serious illness communication skills, few report receiving communication skills training during fellowship (27,28). As a result, few nephrologists have the skillset to conduct conversations about serious illness (29), leaving them uncomfortable broaching end-of-life topics and inadequately prepared to respond to the strong emotions that serious illness conversations stir up, which may contribute to avoidance. Identifying the right time for the conversation from the patient perspective in both disease course and day to day care is challenging. With nearly 60% of patients on dialysis regretting their decision (11), it is clear that a serious illness conversation should occur before a patient starts dialysis. Patients generally expect such conversations to be initiated by their clinician, but nephrologists, like many clinicians, do not routinely initiate in-depth serious illness conversations until late in the disease course if at all (11,30). After beginning dialysis, patients can still benefit from serious illness conversations to explore their goals and preferences as their illness and dialysis experience evolve. Finding the time for such a conversation with patients on dialysis, however, is fraught with logistical challenges. Most of the time spent at the dialysis unit is in the dialysis chair undergoing treatment. Cognitive changes associated with dialysis treatment may make it challenging for patients to fully engage in the complex process necessary to weigh treatments, risks and benefits, and potential outcomes while undergoing dialysis (31). Conducting the conversation while the patient is on dialysis also does not afford the privacy often desired by patients for such a delicate discussion (32). Similarly, time and space constraints at the dialysis unit, especially at the dialysis chair, may also limit the participation of family or caregivers. Spending extra time at the dialysis unit, however, is often undesirable or impractical, especially because patients are often dependent on others for transportation to and from dialysis. When they do occur, conversations about serious illness in the dialysis setting are variable and frequently focus on identifying a surrogate decision maker, completing a Physician Order for Life Sustaining Therapy (POLST) or a Medical Order for Life Sustaining Therapy (MOLST), or establishing resuscitation and intubation status, rarely addressing preferences with respect to dialysis experience or withdrawal (22). Furthermore, even when exploring patient understanding and preferences more fully, nephrologists tend to focus on the dialysis procedure and disease management (dialysis treatment and adequacy, infection risks, dietary restrictions, and laboratory measurements) rather than patient-centered goals and preferences (25), such as symptoms, quality of life, and suffering, which are the factors more commonly weighed by patients in decision making about dialysis (33). Documentation and sharing of conversation content can be challenging when dialysis units use proprietary electronic medical records (EMRs) that do not integrate with other care providers, hospitals, and care facilities at transitions in care. In one study, among patients who reported discussing their serious illness and advance directives with their primary care physician (PCP), neither the content of the conversation nor the advance directive were conveyed to the nephrologist or dialysis unit by either the patient or the PCP (32). This fragmentation in care and documentation contributes to a lack of accountability in conducting serious illness conversations as well as a lack of awareness across settings about patient preferences (26). Finally, to make serious illness conversations a standard of care in the dialysis population, metrics to reflect best practices (e.g., timing, frequency, quality, and effect) for these conversations are needed to evaluate and improve their use in the dialysis setting (34). Because of the high morbidity and mortality associated with dialysis and patients’ preference to discuss their illness trajectory with their clinician (11), serious illness conversations should be conducted with all patients with advanced kidney disease who are considering whether to choose dialysis and/or their health care proxies. Such conversations will initiate a shared decision-making process as recommended by the Renal Physicians Association/American Society of Nephrology guidelines for initiation and withdrawal of dialysis (35) and fulfill the recommendation of the American Society of Nephrology as part of the Choosing Wisely Campaign (36). Considering the high rate of regret in pursuing dialysis and frequent decisions to withdraw from dialysis, serious illness conversations should also occur at regular intervals after dialysis treatment has begun. Implementation of serious illness conversations among patients already on dialysis requires a system to identify the patients for whom these conversations are most needed and could add the most value. Options could include using an age cutoff, a functional status assessment, or screening tools, such as the surprise question (would you be surprised if your patient died in the next 12 months? ), a validated predictor of mortality in the dialysis population (37) that can identify patients on dialysis at higher risk of decline or death. The Cohen 6-month Mortality Predictor (which includes age, answer to the surprise question, albumin, and presence or absence of dementia or peripheral vascular disease) (38) is a more refined screening tool that could similarly identify high-risk patients for prioritization among patients already on dialysis. Serious illness conversations with patients on dialysis could be conducted by one or more individuals, including nephrologists, dialysis nurses, social workers, and PCPs. Qualitative studies of patients on dialysis have reported that patients prefer to conduct conversations about goals and advance directives with someone that they trust, can speak freely with, and who knows them well (32). Patients generally identified either their nephrologist or their PCP as the individual with whom they would want to have such a conversation, although some also named their dialysis unit social worker (11,32). The patient’s nephrologist, as the clinician with medical knowledge of the patient’s disease status and prognosis, is in a strong position to have this conversation. This responsibility could also be shared by members of the dialysis care team, with the medical information and prognosis addressed by the nephrologist and the discussion of goals, values, and preferences led by the social worker, who often has a relationship with patients and is trained and experienced in discussing sensitive topics with patients and families. A team approach to this conversation requires communication among the members of the dialysis care team to assure that there is a coordinated approach and that the content of the conversation is shared with other members of the dialysis care team. Timing of conversations includes identifying both triggers to prompt conversations (Table 1) and a specific time to conduct them. Conversations should occur at a time when the patient is stable and able to consider goals, values, and preferences without the need to make health care decisions under duress and without the added stress of an acute illness. Repeat or ongoing conversations could be prompted by a change in patient status or an event that harbors significance for the illness trajectory, which may lead to reassessment of goals, preferences, and acceptable tradeoffs and allow for thoughtful consideration of how recent care episodes may inform future care. Triggers for serious illness conversations before dialysis initiation could include referral for dialysis modality teaching, access creation, or transplant evaluation. Serious illness conversations could also be incorporated into the routine admission process to a dialysis unit. After beginning dialysis treatment, events with prognostic significance or that raise questions of tradeoffs, such as after access placement, access procedures, or a prolonged hospital admission, would represent suitable triggers for a subsequent conversation. Patient care plan assessments are mandated by the Centers for Medicare and Medicaid Services at admission to the dialysis unit, after 3 months, after prolonged hospital admission, and at minimum, annually (39). Serious illness conversations could also be conducted and repeated at similar defined time intervals, in coordination with routine care plan meetings and irrespective of a change in status, to ensure open lines of communication between patients and clinicians to revisit important topics as treatment proceeds. Because patients on dialysis spend a significant amount of time at their dialysis unit, it could be a convenient location for conversations to occur. In surveys and focus groups of patients on dialysis, location preference varies, with some individuals preferring a private space, whereas others favor at the chair during dialysis so as not to extend their time at the unit (11,32). Additionally, there may be cognitive or other limitations (such as ambient noise) precluding a conversation chairside (31). Specific location at the dialysis unit, therefore, would need to be determined on the basis of space constraints, environment, patient limitations (e.g., cognitive or communication impairment), and patient preferences. Alternatives to the dialysis unit would include the physician’s office. Although the global physician payment imposes restrictions on reimbursement for additional visits with the nephrologist outside the dialysis unit, recent changes to Medicare to reimburse physicians for advance care planning and end-of-life care conversations (26) may help mitigate such challenges. What Is the Content of the Conversation? Serious illness conversations can be difficult and emotionally draining for both patients and clinicians. Using a structured communication guide or checklist can help focus both patients and clinicians, improve quality, reduce variation, and ensure that critical issues and concerns are addressed while providing direction to a challenging conversation (40,41). Recently, the Serious Illness Conversation Guide (the Guide) has been developed to support clinicians and ensure adherence to best practices in conducting serious illness conversations (12,42). The Guide has been tested as part of a randomized, controlled trial in oncology as well as in implementation trials in primary care and chronic critical illness. Preliminary data from the oncology trial show the feasibility and acceptability to patients and clinicians as well as increased frequency of conversations, earlier and better quality conversations, and improvements in patient wellbeing. 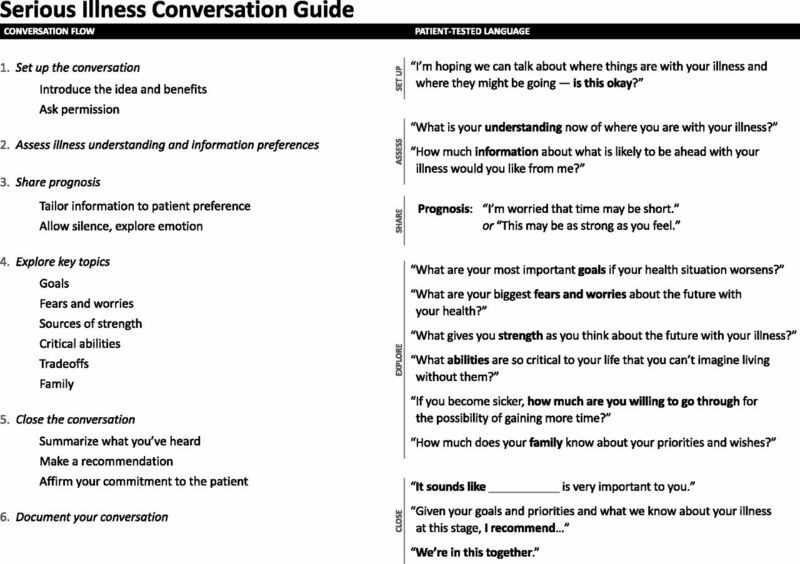 The Guide prescribes a formal setup for the conversation to contextualize the conversation in the patient’s illness trajectory; this includes asking permission to engage the patient in discussing their illness, goals, and preferences; framing the conversation as an opportunity to think in advance and be prepared, noting the benefit to the patient and family members in having thought through and discussed the patient’s goals and values; and emphasizing that decisions need not be made at the time of the conversation to alleviate any pressure to reach definitive conclusions regarding care in a short period of time. Asking permission also includes exploring which individuals should be present at the conversation. After the setup is complete, the Guide (Figure 1) comprises the following elements. (1) Patient understanding of their illness. The understanding of their illness and prognosis that patients on dialysis have often differs from that of their nephrologist (10). Opening the conversation by exploring the patient’s understanding allows the clinician to focus the discussion to the patient’s level and helps the clinician appreciate the patient’s degree of acceptance of the illness. In exploring patient understanding, clinicians must recognize that, unlike in other clinical settings, such as oncology, patients on dialysis do not always relate to their ESRD as a distinct disease that exerts a strong influence on their morbidity and mortality (17). In opening the conversation, it may be necessary to explore his/her health status more broadly, asking about the patient’s view of his/her health over the past 3–6 months, before more circumscribed questions about how he/she is tolerating or experiencing dialysis and what he/she understands to be ahead. Furthermore, when making decisions about dialysis, patients with kidney disease are more inclined to consider how dialysis may affect their ability to maintain their daily routines and quality of life than the effectiveness of dialysis and associated medications in correcting their metabolic and other abnormalities (33). As such, when assessing patient understanding and seeking to fill knowledge gaps, nephrologists should focus on the effect of dialysis on quality of life considerations, including functional expectations and burden of procedures and hospital admissions, rather than the details of laboratory and other parameters. (2) Information preferences. Although studies show that there is significant unmet need in communication between dialysis patients and clinicians around prognosis and end-of-life issues, preferences for the content and delivery of prognostic conversations can vary between patients (17,32). Level of understanding, degree of acceptance of illness, and openness to frank prognostic conversations can all determine what aspects of prognosis a patient is willing or ready to discuss. Eliciting the patient’s preferences about whether and how he/she wishes prognosis to be discussed allows the clinician to provide information as requested by the patient, engaging the patient as a partner and smoothing the path to the challenging conversation that will follow. (3) Sharing of prognosis. Prognosis can be framed and shared in several different ways, including a time-based prognosis, a functional prognosis, or an acknowledgment of the uncertainty of prognosis, depending on patient needs and preferences. For time-based prognosis, dialysis clinicians can use the Cohen 6-month Mortality Predictor (38) (available online at www.touchcalc.com and as part of the Calculate mobile application from QxMD) to estimate 6-, 12-, and 18-month mortality for patients on maintenance dialysis to provide a broad range (weeks to months, months to a year, or a year or two) that can serve to frame the conversation “in case time is short.” Time-based prognoses should acknowledge prognostic uncertainty and remind patients that time could be shorter or longer than estimated. Alternatively, for patients who prefer not to talk about prognosis in terms of time, the clinician can offer a functional prognosis, sharing details of their expected functional trajectory on dialysis or what to anticipate in terms of further medical problems, hospitalizations, and procedures and how this might affect their quality of life. For clinicians engaging patients with CKD in serious illness conversations before dialysis, the Tangri Kidney Failure Risk Equation (available both online at www.kidneyfailurerisk.com and as part of the Calculate mobile application from QxMD) can be used to estimate likelihood of progression to ESRD and inform the conversation as it relates to consideration of and preparation for future dialysis needs. Finally, for those patients whose prognosis is very uncertain or who prefer not to discuss it in terms of time or function, the clinician can acknowledge the uncertainty of prognosis and align with the patient’s hopefulness for their future, and then the clinician can frame the possibility of sudden change or deterioration as a way of “hoping for the best but preparing for the worst.” Thinking in advance about these issues reminds the patient of the real unpredictability of advanced kidney disease and may prompt the patient to reflect and engage family members in discussions about care goals. (4) Goals. Understanding patient goals can help the clinician address priorities in recommending an individualized care plan. Both health-related goals (maintaining function or independence or maximizing quality or quantity of life) as well as personal goals (participation in milestone events, such as weddings, births, or graduations, fulfilling travel or other lifelong hopes, or spending time with loved ones) should be explored. Helping the patient to focus on and articulate these goals also maintains the patient’s sense of purpose and control, mitigating the feelings of despair and hopelessness that can characterize serious illness (17,43). (5) Fears and worries. Like goals, fears explored should include both health-related (symptom burden, suffering, and quality of life) and personal (family dynamics and perception of being a burden) concerns that could be contributing to patient distress in their experience of serious illness. Articulating these fears helps the patient feel understood and can enhance his/her therapeutic alliance with his/her clinician (17). Additionally, this helps the clinician focus the treatment plan to address or preempt the described experiences that the patient most wishes to avoid. (6) Sources of strength. Patients draw strength from many sources, such as family, friendships, and faith, including religious practices, community, and spirituality. Exploring sources of strength with patients serves to identify other resources to harness in helping the patient cope with his/her serious illness. This also shows the patient that the clinician seeks to understand, and respects, the patient’s value system, which is particularly important to black patients with serious illnesses (44,45). (7) Acceptable or critical function. Functional dependence frequently increases after initiation of dialysis for both institutionalized and community-dwelling individuals (4,46,47), and it is, therefore, critical to explore what functional changes might lead the patient to reconsider his/her plan of care. For some patients, intact cognitive function may be most important to their sense of being, whereas for others, the ability to eat or toilet independently are of fundamental importance. Still others may demand more functional independence, such as being able to walk or participate in activities outside their home. Eliciting the patients’ perspective on what levels of function or independence are critical to them can help clarify what circumstances may lead them to favor altering the focus of, reducing, or stopping their medical care. (8) Tradeoffs. Undergoing dialysis is associated with significant burdens, including access procedures, hospitalizations, and intensive care, with resultant functional decline and need for rehabilitation (4,9,46,47). Patients may weigh these burdens against quality of life considerations, including time at home and functional independence, differently. A serious illness conversation can, therefore, be a time for the patient to reflect on these tradeoffs to promote informed decision making in the future. Clinicians should explore how changing circumstances, such as loss of critical functions or unachievable goals, may affect patients’ decisions to continue dialysis. This should include whether they would wish to withdraw from dialysis as well as exploration of whether, under particular circumstances, they would continue dialysis but circumscribe future interventions (such as limiting future access procedures in the event of access difficulty or failure or use of vasopressors in the event of hemodynamic difficulties). In addition to tradeoffs directly related to dialysis, patient attitudes toward other procedures and support measures, such as cardiopulmonary resuscitation, mechanical ventilation, artificial nutrition, institutionalization, and other escalations in care that are potentially anticipated, can be explored as well. (9) Family engagement/involvement. Patients differ in how much and in what roles they wish to engage family members in their care (32). Patients often fear burdening their families or caregivers. Exploring how to involve family and facilitating that engagement can relieve patient anxiety, while also improving family outcomes with respect to coping with a loved one’s serious illness and eventual bereavement (48). Additionally, including health care proxies or family in serious illness conversations and the advance care planning process can enhance congruence between patient and surrogate about goals and preferences and may reduce future conflict around end-of-life decision making (48). The formulation and language used for each of these topics may differ depending on the patient circumstances and timing or trigger for the serious illness conversation. Sample language to be used by the clinician for several health scenarios or triggers is outlined in Table 2. The Guide then concludes with the clinician summarizing what he or she took away from the conversation, making a recommendation for care when appropriate, and affirming the clinician’s commitment to guide the patient through his/her serious illness. The Guide is designed to be used by clinicians who have undergone a 2.5-hour training program to help them learn basic competencies in using the Guide, including responding to patient emotion and formulating recommendations. Several training approaches provide guidance in discussing serious illness issues and responding to the emotions that they often stir up in patients. For example, NephroTalk is a communication skills training program developed to teach nephrologists communication skills and techniques for discussing serious illness, sharing bad news, and discussing goals of care with patients (49,50). NephroTalk encourages open-ended questions to elicit patient goals, uses wish statements to respond to unrealistic goals and expectations, and uses VitalTalk’s NURSE (51) mnemonic to respond to patient emotions elicited during the conversation (49,50). Finally, in making recommendations at the conclusion of the conversation, the clinician can use VitalTalk’s REMAP (52) or the SPIRES (53) framework to incorporate aspects of the serious illness conversation into a recommendation about future medical interventions or dialysis treatment. The content of the serious illness conversation should be documented in the EMR and titled accordingly for easy reference, ideally in a special section of the EMR designated for information relevant to advance care planning. This can be done as an open, free-texted note or in template form with drop-down menu choices and free text for each topic explored. Communication about serious illness conversation content to other providers is an essential step in the provision of quality care to this population. Dialysis units often have systems and processes in place to ensure the transmission of clinical data—such as dialysis prescriptions, medication lists, run sheets, or monthly laboratory values—at transitions in care. The content of these conversations should be formally included in the information shared at transitions in care, ensuring that the information will be conveyed to the acute care setting where inpatient or subsequent dialysis will be provided. Similarly, the conversation content documentation must be shared with the PCP caring for the patient. Finally, because patient retention of medical information is enhanced by providing written materials (54), a copy of the documentation of the conversation can be shared with patients to both enhance patient retention of the information shared and discussed and facilitate the patient’s sharing with health care proxies, family members, and even other medical providers. To successfully implement and continually improve serious illness conversations for patients on dialysis, it is necessary to identify metrics that can be used to assess their effect. Tracking the proportion of patients having serious illness conversations, the timing in disease course at which they occur, the proportion documented in the dialysis EMR, and the proportion transmitted to the PCP and other relevant facilities is an essential step in assessing the implementation of serious illness conversations in dialysis units and ensuring the quality and safety of medical care. Furthermore, all patients on dialysis, because of the high morbidity and mortality associated with their disease and its treatment, should be required to designate a health care proxy in the dialysis EMR in case of emergency; adherence to this standard should be measured and tracked. Finally, the proportion of patients completing a POLST/MOLST or advance directive that addresses preferences relating specifically to dialysis and conditions for withdrawal from dialysis are also useful metrics. Dialysis is associated with high morbidity, mortality, and illness burden. Serious illness conversations can help patients identify and share their goals, values, and preferences and assist patients and clinicians in developing and adapting the plan of care to ensure goal-consistent care. Implementing serious illness conversations for patients on dialysis involves identifying patients at the highest risk of adverse outcomes, triggering conversations, and conducting them routinely. The Guide provides a tested, scalable structure for conducting these conversations that can be used by nephrologists and other dialysis clinicians, and it can be adapted further to meet the needs of this population. Documentation and sharing of conversation content and identification of metrics to drive performance improvement are also essential to the successful implementation of serious illness conversations for patients on dialysis. E.I.M. discloses attorney-client relationship between spouse’s law firm and DaVita Healthcare Partners, Inc., Denver, CO, Dialysis Clinic, Inc., Nashville, TN, and Fresenius Medical Care, Waltham, MA. Support for this special feature article was provided by the Rx Foundation.